Arrow Sewing Cabinets: I'm A Star!! Olivia reporting in with some exciting news – I’M A STAR!!! There’s a wonderful new TV show called Sew It All and I am center stage! Of course, I can’t do it alone, so there are a few people I should probably mention. First, there’s the host, the wonderful and talented Ellen March. She also has lots of fabulous guests on with her, and my little sister Pixie the cutting table is there as well. Just like all little sisters, she thinks she’s the star of the show, but really it’s me . 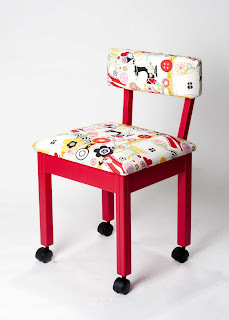 When you check out the preview video here, you may see I have a zippy new accessory - a red sewing chair!! Isn't she pretty? I must say, she makes me feel pretty spunky when we’re working together (like Ms. Owner feels when she gets a new pair of shoes). If you'd like more information on my new chair, call the wonderful folks at Arrow Customer service, 1-800-533-7347. If you'd like your local PBS station to carry Sew It All in your area, please email them and let them know (you can find your local station here). And please, no autographs! It may go to my head!